Egg-and-dart or Egg-and-tongue is an ornamental device often carved in wood, stone, or plaster quarter-round ovolo mouldings, consisting of an egg-shaped object alternating with an element shaped like an arrow, anchor or dart. Egg-and-dart enrichment of the ovolo molding of the Ionic capital is found in Ancient Greek architecture at the Erechtheion and was used by the Romans. 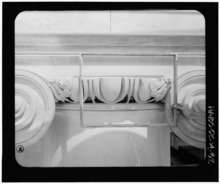 The motif has also been common in neoclassical architecture. The ornament is used to decorate building exterior. The egg-and-dart moulding on a building cornice. Archaeological site in Ostia Antica. Architectural fragment with egg-and-dart moulding in Antalya, Turkey. The moulding in Hôtel d'Alluye at Blois, Loir-et-Cher, France. ↑ Regan, Raina (February 21, 2012). "Building Language: Egg-and-dart". Historic Indianapolis. historicindianapolis.com. Retrieved 11 September 2016. ↑ "Egg-and-dart". Buffalo as an Architectural Museum. buffaloah.com. Retrieved 11 September 2016.